Source: Mexico, Canada and the United States. Handling Tips: 50° F. Do not chill. Keep dry. 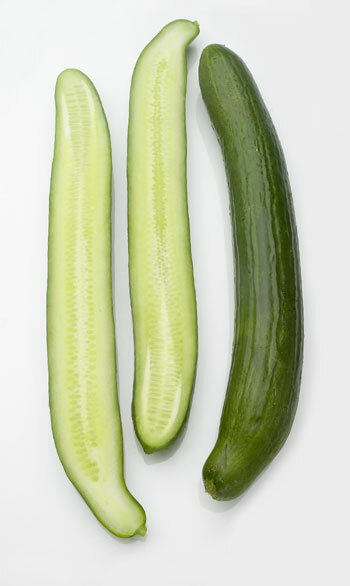 General Information: These cucumbers are long and thin with very few small white seeds. The skin is very thin and less bitter than slicing cucumbers. The flavor of this variety of cucumber is less bitter than many other types due to the fewer seeds. They are sought after by those with sensitive stomachs as Hothouse Cucumbers tend to be "burpless". Cucumber may be enjoyed butter-steamed, stir-fried or raw. Applications: The English cucumber is often served in vegetable dishes, fresh salads, sauces, cold soups such as cucumber or gazpacho, or simply as a snack with dips.